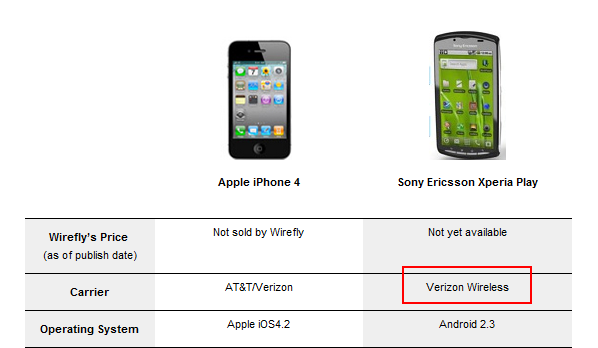 According to a chart that went live at Wirefly’s site on February 3rd, the Sony Xperia PLAY is headed to Verizon. Yep, this would be the Playstation phone that we’ve been covering over at Android Life, but was kept far from the pages of DL since we assumed it wouldn’t come anywhere near Big Red. The PLAY hasn’t been announced on a carrier yet, but could be on Sunday in a press event that kicks off just before MWC. I guess we’ll know at that time if that chart needs to see some quick editing. And I have to admit that seeing this phone on Verizon would shock the heck out of me. Need a few specs? How does a 4″ LCD screen, Gingerbread, 5MP camera and the ultimate gaming slide-out keyboard sound? Anyone interested? The PLAY’s Super Bowl ad featuring Andy and his creepy thumbs after the break.